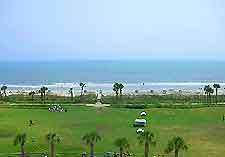 With such a long coastline, Myrtle Beach is lucky because it has an abundance of natural beauty, ranging from rugged Atlantic beaches to groomed parks. Myrtle Beach and Huntington Beach state parks are among residents' favorites, as is Brookgreen Gardens, which offer visitors the chance to tour the sculpture garden and learn about local wildlife and history. Within easy driving distance of Myrtle Beach are several other parks, where you can soak up the greenery, learn about American Indian history, enjoy a picnic and relax in natural surroundings and landscaped gardens. 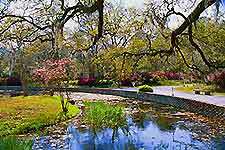 Formerly land that was used as a rice and indigo plantation, Myrtle Beach's Brookgreen Gardens encompasses an area of 9,100 acres with over 500 sculptures dotted throughout the preserve. Other interesting features include exhibits on wildlife and displays of historically important artifacts. Gourmet picnic baskets are available from the garden's kitchens and can be taken anywhere in the gardens. Located north of Atlanta and west of Ashville in North Carolina and Tennessee, the Great Smoky Mountains National Park is the most visited national park in the whole of the US. During the peak summer season visitor's flock to this huge park and roads often become jammed with visitors touring the park. The most popular base town is Cherokee, which offers accommodation, theme attractions, American Indian retailers, a casino and plenty of diners and fast-food outlets. The park offers a good insight into Cherokee Indian history and heritage through its exhibitions and museums. 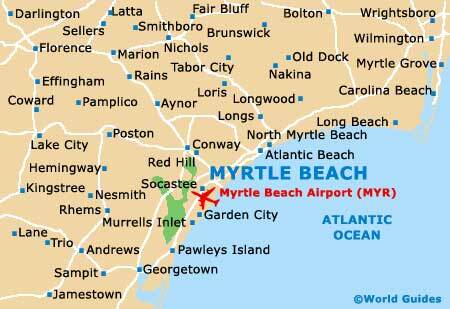 One of the few remaining natural areas within the city is the Myrtle Beach State Park, with its miles of Atlantic coastline, 312 acres / 126 hectares of land, campsite and cabin accommodation, nature center, gift shop, playground, pier and hiking trails. The park was the first state park in South Carolina and has become one of the city's most popular patches of greenery. 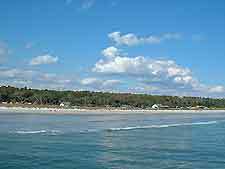 Boasting the best preserved beach on the Grand Strand's 60-mile / 96-km long coastline, the nearby Huntington Beach State Park offers beautiful scenery and wildlife along with a varied environment including a freshwater lagoon, salt marshes, forests and sand beaches. Within the park's perimeters is the National Historic Landmark of Atalaya. This Moorish-style home of the late US sculptress Anna Huntington and her husband is popular among visitors. Facilities in the park include a campsite and educational center. Located inland from Myrtle Beach, Little Pee Dee State Park is one of the most tranquil parks in the state. The Little Pee Dee River runs through the park, while the 54-acre / 22-hectare Lake Norton sits still; both offer peaceful reflections of the forest and sky that surround them. Once inhabited by the Pee Dee Indians, the protected area is now home to several species of wildlife. Encompassing a campsite, picnic ground and nature trails, the park is easily accessible from Myrtle Beach and well worth the car journey.